St Louis Public Schools / Welcome to SLPS! The St. Louis Public School District is seeking applications for the current vacant position on the board of education. An individual will be appointed to fill the vacant position until the November 2020 elections have been held and certified and a newly elected individual has been sworn-in to fill the remainder of this position’s term. Interested persons must submit a letter expressing interest in the board position and their qualifications for the position no later than 4:00 p.m. on Thursday, April 25, 2019. Letters may be submitted to the district office located at 113 East Saginaw Street in St. Louis. Following a review of the submitted materials, the board will schedule interviews with selected candidates. Not all candidates for the board vacancy will be interviewed. If you have any questions concerning the role of the board of education and the responsibilities of a board member, please contact Kristi Teall, Superintendent of Schools, at (989) 681-2545. The St. Louis High School Spanish Club would like to thank the businesses, organizations, and individuals from the local communities that supported our recent trip to Panama. Your support during our fundraisers over the past two years has been overwhelming. 33 students and 6 adults spent 9 days traveling throughout Panama while learning about the culture, history, geography, and language of a beautiful country. The club would like to extend its most sincere gracias to everybody for helping cultivate such an incredible and educational experience for our youth. Thanks for helping our small town kids do big things! Check out our highlight video! Outstanding business students will travel to Anaheim, California in May to participate in the Business Professionals of America National Leadership Conference, “Together We Create.” Overall, 18 students placed at the State Leadership Conference. 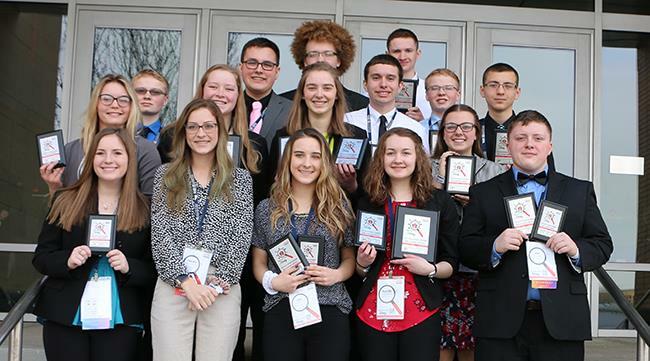 Seven of these students will join over 5,000 other conference delegates from across the nation to participate in business skills competitions at the national level. With a grant from the Gratiot Community Foundation, sophomores and juniors from St. Louis High School were able to travel to Farmington Hills to the Holocaust Memorial Center. The purpose of the trip was to enhance students’ understanding of the Holocaust and the events that led to the systematic murder of the Jewish people. It also helped students to understand that the history of the Holocaust raises questions about human behavior and the context within which individual decisions are made. This trip helped students learn the difficult truths about why the Holocaust happened and required critical thinking and introspection on the part of students to understand the complexity of genocide. View full article here. The State FFA Degree is highest award the State Association gives its student members. Students must have been an active FFA member for a minimum of two years, completing 360 hours of school based agricultural education. They must also have a productive Supervised Agricultural Experience which is conducted outside of school where they have invested an additional 300 hours. Members must have also demonstrated their leadership abilities through a speech, demonstration of parliamentary procedure, and serve as a committee member or as a chapter officer. 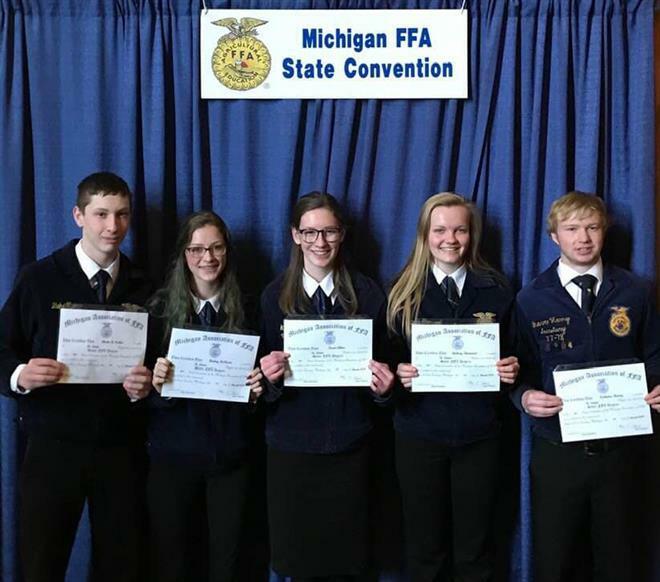 FFA Members who receive this award have completed a minimum of 25 service hours and have a satisfactory academic record verified by school administration. The Michigan State FFA Degree is also counted by Michigan State University for six general education credits and can be applied to any degree track at MSU. On average, only 6% of FFA members earn their state degree. I would like to start this letter with a big thank you! The staff, parents, students, and our community have been incredibly supportive of the crazy amount of snow days our school has had to endure. Your patience and understanding is appreciated more than you know. Anytime a snow day is called, it causes difficulties with our families. Many of our families have had to make accommodations to stay home from work to be with their children. Thank you to our local community for giving our families the flexibility to do just that. Your understanding doesn't go unnoticed. We are proud to be a part of such a great community. The safety of our students is always our first priority. 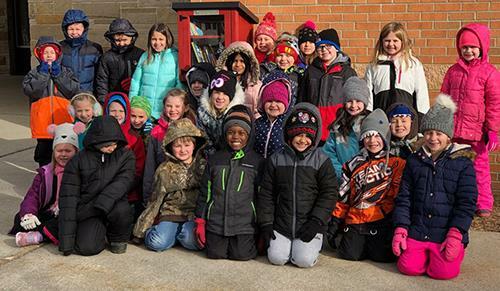 Every single day that there is a potential weather event, all 9 local Superintendents and all 9 Transportation Directors in Gratiot and Isabella Counties begin conversations between 4:30 a.m. and 4:45 a.m. Many additional conversations go into the final decision. These often include the local authorities, County Road Commissioners, County Emergency Managers, and during the two most recent storms, have included the National Weather Service. As you know we have had a substantial amount of snow days and delays this school year. To date we have had 14 snow days and 3 delays. This year has been one of the worst winters I have encountered as a Superintendent. I have been asked several times in the last week about the last day of school and when it would be. I realize that people have made travel plans or other plans after school gets out, but it is impossible for me to give an end date for the 18-19 school year at this point. We still have a lot of winter left, and we could have more days off in the future. There have also been some bills introduced to the legislature that if made into law, could change how we have to calculate the time we need to make up. The State of Michigan allows us 6 days. We also have the ability to request 3 additional days of forgiveness, but there is no guarantee we will be granted those days. We have to make up 8 school days based on what we know today. I want to thank all of you again for your patience and understanding as we attempt to get through this winter weather together. You may have noticed a new addition outside of Carrie Knause! We now have our own little free library! One of our 2nd graders in Mrs. Jenkin's class thought this would be a great addition to our school. Her and her classmates then pursued a grant through the Youth Advisory Council with the Gratiot Community Foundation to secure the funds for this project! Please feel free to grab a book when your child needs something to read or swap us books after your child has finished reading one of their books! 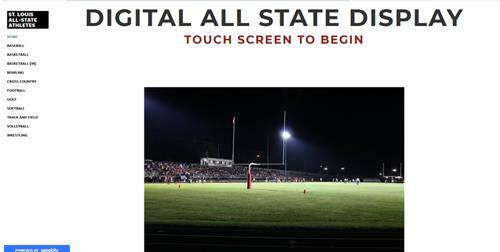 Please check out our new interactive touch screen display just outside the gym for All-State athletes at SLHS! All you have to do is walk up and touch the display to interact with it. This is an ongoing project by some of our business students and we are working to get it updated and current. If you have additions to this site, please email Mr. Hemker. Also, for most of the athletes we had to scan in old yearbook photos so if you have an updated photo of yourself, please send it on as well. Check out the video in the recent Shark Scene article to see it in action. You can also view the site online. Schools in Gratiot and Isabella counties participate in a cross-district Schools of Choice Program. Parents can consider a school that best fits their child's individual needs. Schools of Choice applications must be completed and submitted to the Gratiot-Isabella Region Education Service District. Visit the Schools of Choice Program website for more information. The Bell St Louis Bond Promo Video from MAC TV Network. We are the St. Louis Sharks! Our motto that St. Louis Public Schools lives by is: “Together we Can, Together we Do!” We have had that motto for the past two years and will continue to live by that. “Together we Can, Together we Do!” means we really need to work together. Working together will bring support and pride to everyone. Working together will allow for us to always put kids first. We take pride in our programming, our staff, our students, and our community. Check out our Shark Pride Archive to see what's been happening throughout the year. Consider applying to be a substitute teacher in our district! The technology foundation exists solely for the purpose of raising money for the purchase of technology and other educational items for the St. Louis Public Schools. Purchased technology will be used directly by teachers and students and will help the teachers provide the highest quality education. Make a purchase from Amazon.com through the search form at the bottom of the Tech Foundation page and the St. Louis Sharks Technology Foundation will receive up to 20% of your purchase price! In the event that you are having difficulty accessing information on our website relating to District programs, services or activities, please contact Eugene Binder at 989-681-5131.